The index opened positive and went on to touch 8800, but saw huge sell-off to close weak at 8591.25, huge loss of 153.90 points. The broader market was weak with 126 advances to 1532 declines. Range at the start of series 8400-9000. 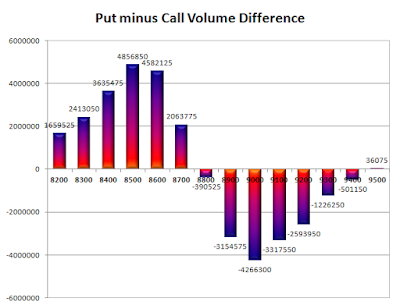 Call option 8000-9300 added huge 55.46 lacs OI. Put option 8600-8000 added 52.53 lacs OI with short covering at 8700 and above strike prices. 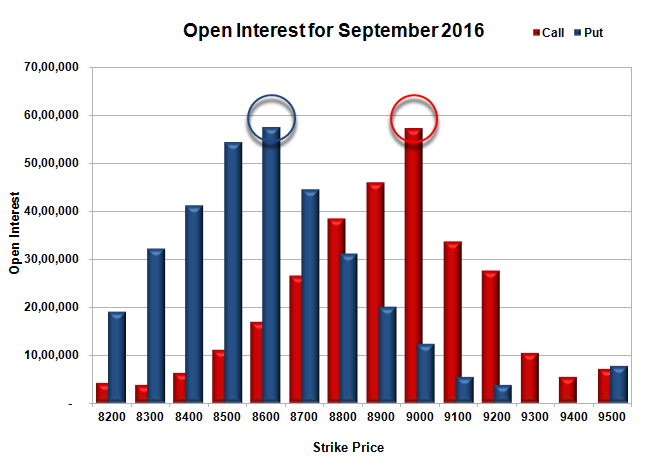 Nifty Open Interest is at 2,38,23,600 up by 60,34,575 with decrease in price, 100% roll-over with huge short build-up. 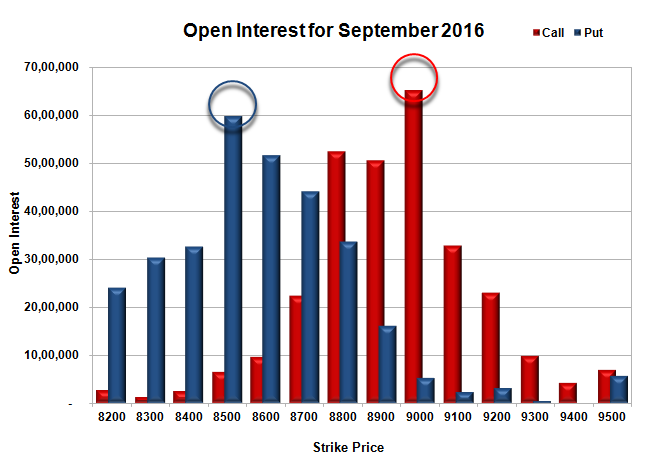 Bank Nifty Open Interest is at 18,78,000 up by 7,75,200 with decrease in price, 100% roll-over with huge short build-up. FII’s bought 13804 contracts of Index Futures, which includes net 154523 contracts long liquidation and 56871 contracts short covering, with decrease in net OI by 211394 contracts, includes 152766 longs to 138962 shorts for the day. FII’s Index future open contract as on date is 245091 Longs to 34363 Shorts, Net long 210728 contracts. Initial support at 8600, with OI of 29.72 lacs and below that at 8500 with OI of 29.54 lacs. 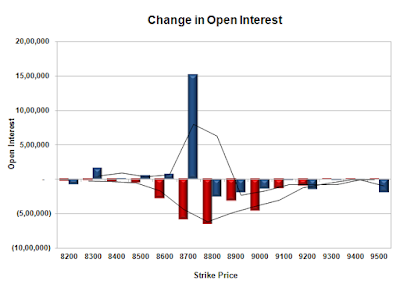 Initial resistance at 8700, with OI of 16.92 lacs and above that at 8800 with OI of 24.31 lacs. 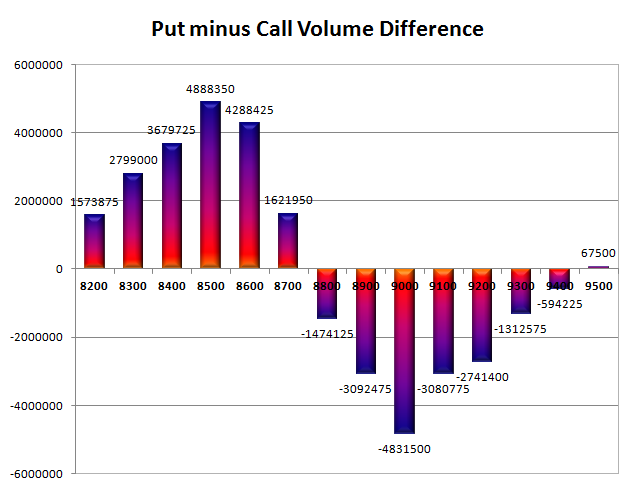 Day Range as per Option Table is 8561 - 8717 and as per VIX is 8508 - 8674 with 8650 as the Pivot. The index opened flat but moved up with each passing hour to close at 8745.15, gain of 38.75 points. The broader market was strong with 1037 advances to 583 declines. Range for expiry 8700-8800. 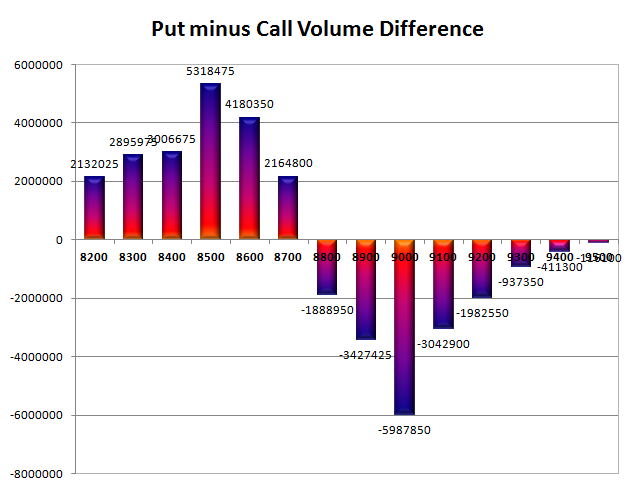 Call option did not add any OI, whereas short covering was seen at 8800 and below strike prices. 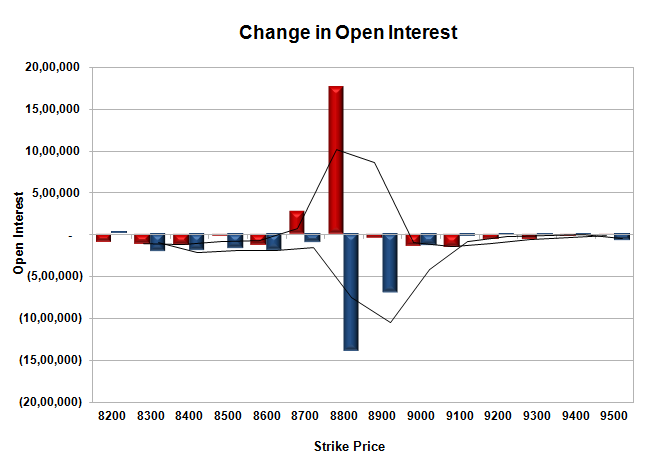 Put option 8700-8300 added 18.22 lacs OI with short covering at 8900 and above strike prices. Nifty Open Interest is at 1,72,71,300 down by 33,24,525, whereas Oct series added 40.35 lacs with increase in price, 100% roll-over with huge long build-up. Bank Nifty Open Interest is at 12,17,800 down by 5,73,360, whereas Oct series added 2.96 lacs with increase in price, small roll-over with huge short covering. 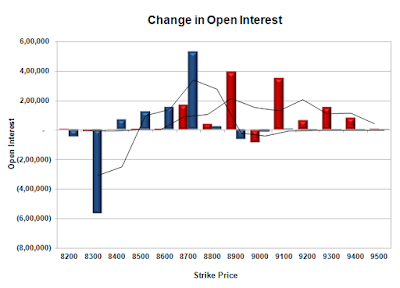 FII’s bought 2717 contracts of Index Futures, which includes net 7987 contracts long build-up and 5270 contracts short build-up, with increase in net OI by 13257 contracts, includes 79693 longs to 76976 shorts for the day. FII’s Index future open contract as on date is 399614 Longs to 91234 Shorts, Net long 308380 contracts. Initial support at 8700, with OI of 58.01 lacs and below that at 8600 with OI of 54.07 lacs. Initial resistance at 8800, with OI of 46.39 lacs and above that at 8900 with OI of 44.47 lacs. Day Range as per Option Table is 8682 - 8799 and as per VIX is 8682 - 8812 with 8738 as the Pivot. The index opened positive and stayed in a narrow range for the better part of the day, but saw huge profit booking in the later part to close at 8831.55, loss of 35.90 points. The broader market was negative with 619 advances to 998 declines. Range stays at 8500-9000. 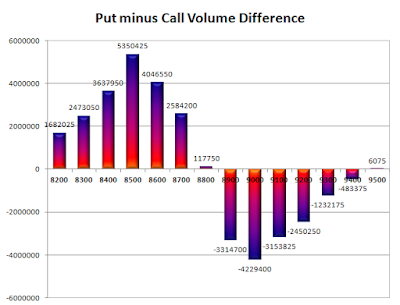 Call option 9000 added 1.62 lacs OI with profit booking at 9100 and above strike prices. 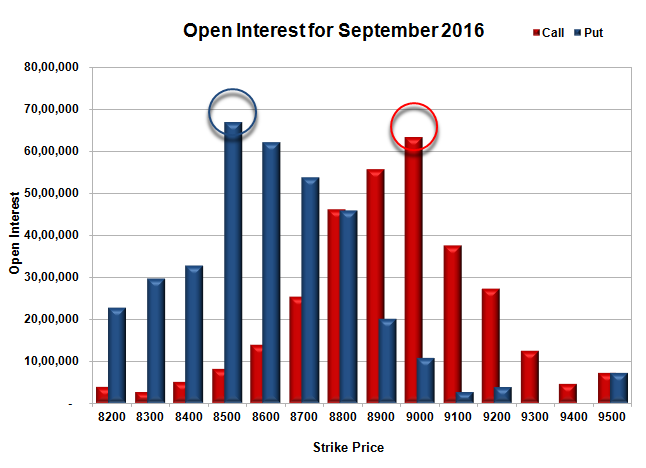 Put option 8300-8200 added 2.61 lacs OI with short covering at 8800 and above strike prices. 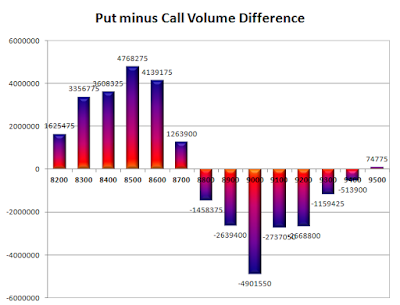 Nifty Open Interest is at 3,13,41,150 down by 8,88,600, whereas Oct series added 6.44 lacs with decrease in price, mostly roll-over with long liquidation. 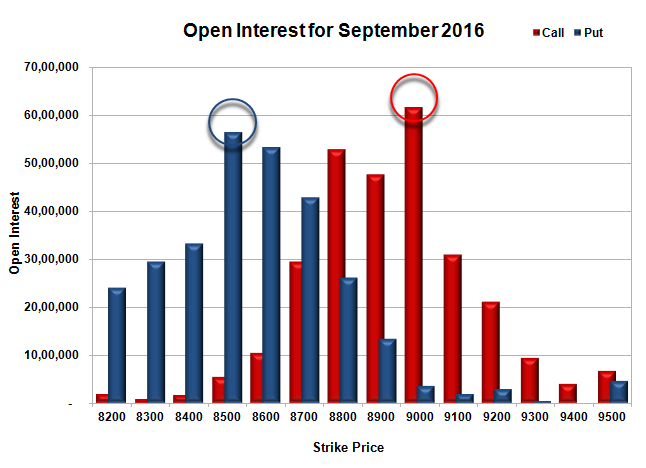 Bank Nifty Open Interest is at 22,36,240 up by 1,08,760, whereas Oct series added 0.32 lacs with decrease in price, probably short build-up in both series. FII’s bought 5245 contracts of Index Futures, which includes net 4820 contracts long build-up and 425 contracts short covering, with increase in net OI by 4395 contracts, includes 30560 longs to 25315 shorts for the day. FII’s Index future open contract as on date is 405113 Longs to 74662 Shorts, Net long 330451 contracts. Initial support still at 8800, with OI of 47.55 lacs and below that at 8700 with OI of 45.13 lacs. 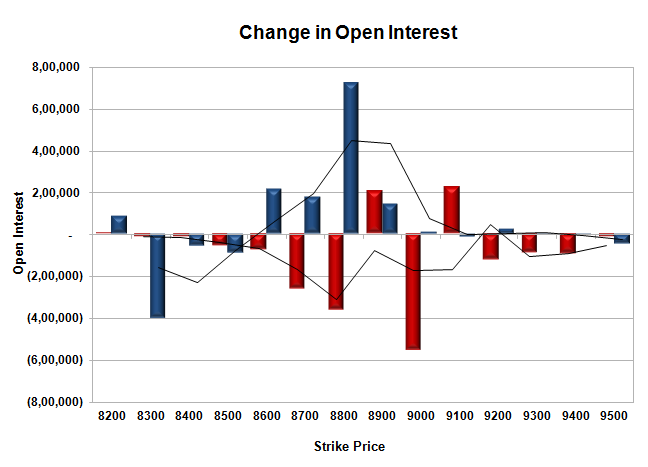 Initial resistance at 8900, with OI of 51.02 lacs and above that at 9000 with OI of 66.65 lacs. Day Range as per Option Table is 8784 - 8900 and as per VIX is 8770 - 8893 with 8846 as the Pivot. The index opened huge gap-up and stayed positive to close at 8867.45, huge gain of 90.30 points. The broader market was strong with 1079 advances to 536 declines. Range stays at 8600-9000. 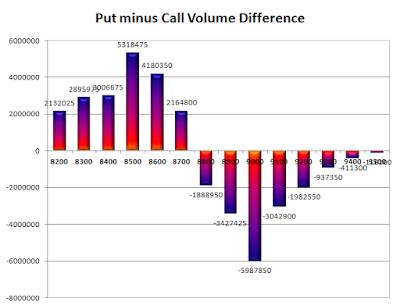 Call option 9000 added 1.76 lacs OI with short covering at 8800 and below strike prices. Put option 8900-8900 added 11.96 lacs OI with profit booking at 8700 and below strike prices. Nifty Open Interest is at 3,22,29,750 down by 1,94,775, with increase in price, probably short covering. Bank Nifty Open Interest is at 21,27,480 down by 18,640, with increase in price, probably short covering. 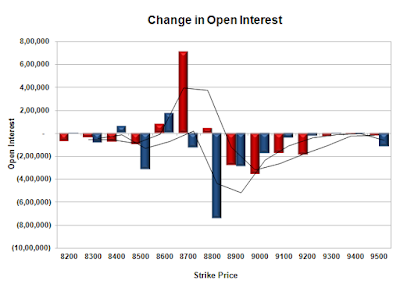 FII’s sold 3512 contracts of Index Futures, which includes net 2694 contracts long liquidation and 818 contracts short build-up, with decrease in net OI by 1876 contracts, includes 45172 longs to 48684 shorts for the day. FII’s Index future open contract as on date is 400293 Longs to 75087 Shorts, Net long 325206 contracts. Initial support at 8800, with OI of 52.80 lacs and below that at 8700 with OI of 47.77 lacs. 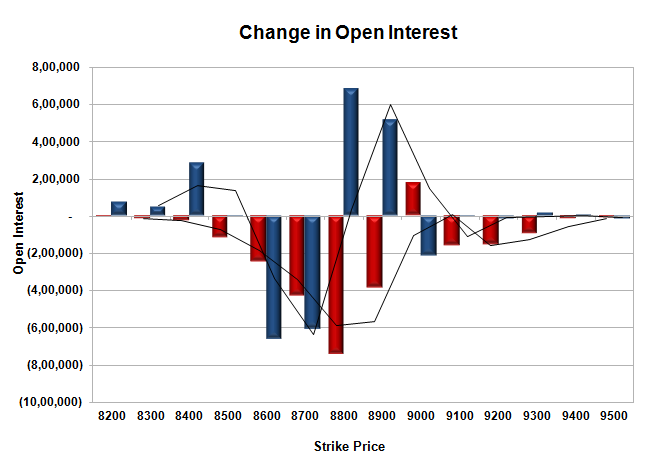 Initial resistance at 8900, with OI of 51.70 lacs and above that at 9000 with OI of 65.03 lacs. 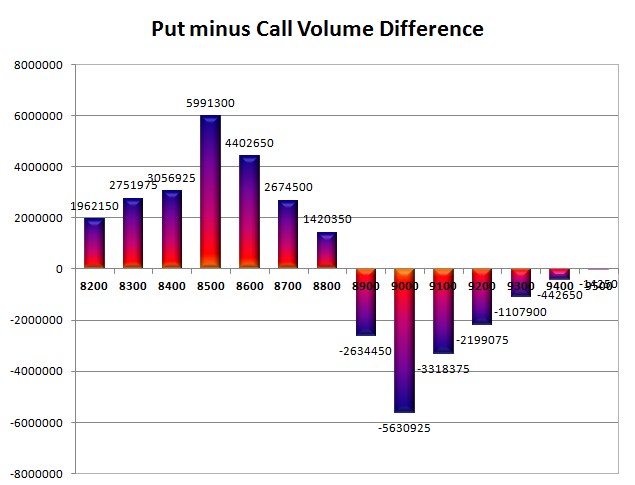 Day Range as per Option Table is 8807 - 8926 and as per VIX is 8806 - 8929 with 8866 as the Pivot. The index opened positive and went up to the touch the highs at 8827 but profit booking saw it close flat at 8777.15, small gain of 1.25 points. The broader market was positive with 832 advances to 799 declines. Range stays at 8600-9000. Call option 8700-9100 added 13.39 lacs OI with profit booking at 9200 and above strike price. Put option 9000-8500 added 13.67 lacs OI with profit booking at 8400 strike price. 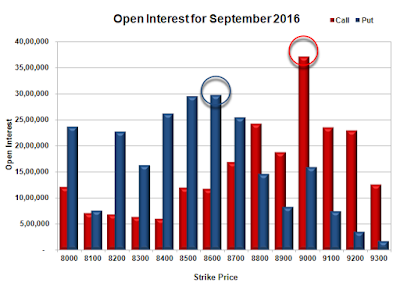 Nifty Open Interest is at 3,24,24,525 up by 1,31,325, with no change in price, probably long build-up. 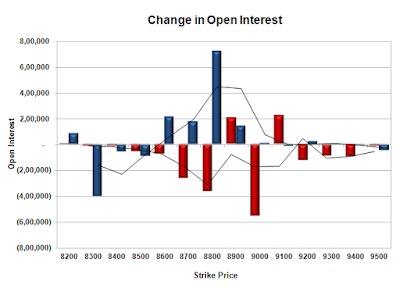 Bank Nifty Open Interest is at 21,54,880 up by 18,640, with decrease in price, probably short build-up. 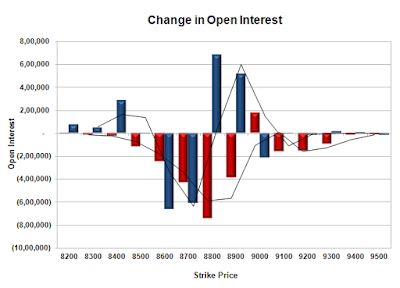 FII’s bought 6360 contracts of Index Futures, which includes net 5618 contracts long build-up and 742 contracts short covering, with increase in net OI by 4876 contracts, includes 30230 longs to 23870 shorts for the day. FII’s Index future open contract as on date is 402987 Longs to 74269 Shorts, Net long 328718 contracts. 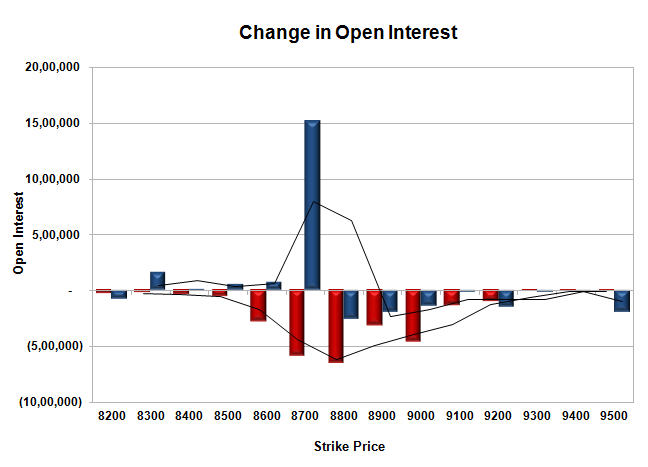 Initial support at 8700, with OI of 53.88 lacs and below that at 8600 with OI of 62.01 lacs. Initial resistance at 8900, with OI of 55.57 lacs and above that at 9000 with OI of 63.26 lacs. 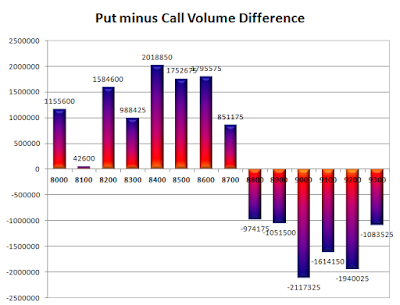 Day Range as per Option Table is 8728 - 8841 and as per VIX is 8709 - 8845 with 8787 as the Pivot. The index opened positive but saw profit booking from the onset to close at 8775.90, loss of 32.50 points. The broader market was weak with 614 advances to 996 declines. Range at 8500-9000. 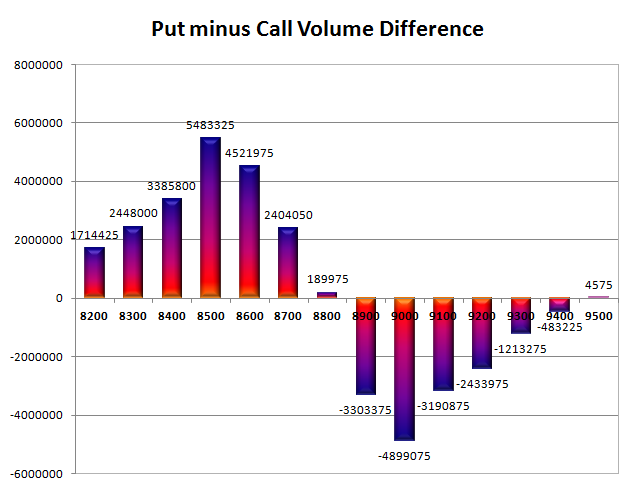 Call option 8800, 9000 added 8.90 lacs OI with profit booking at 8900 and above strike price. Put option 8800, 8600-8500 added 7.44 lacs OI with short covering at 8900 and higher strike prices. 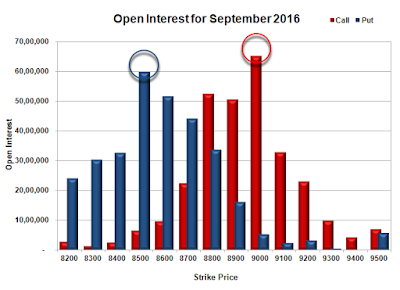 Nifty Open Interest is at 3,22,93,200 down by 1,23,900, with decrease in price, probably long liquidation. Bank Nifty Open Interest is at 21,36,240 down by 45,200, with decrease in price, probably long liquidation. 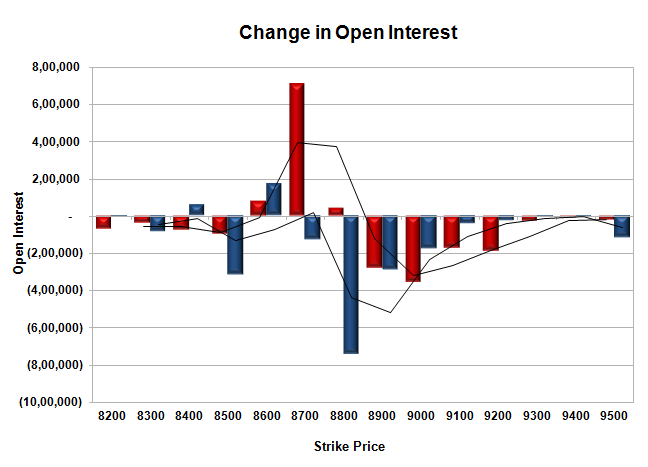 FII’s sold 1617 contracts of Index Futures, which includes net 492 contracts long build-up and 2109 contracts short build-up, with increase in net OI by 2601 contracts, includes 19092 longs to 20709 shorts for the day. 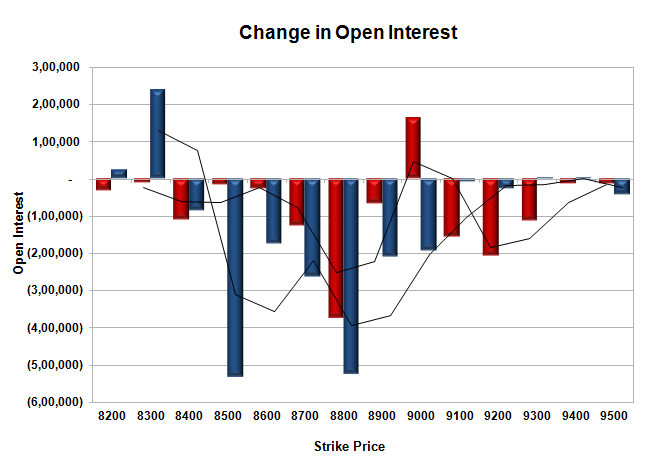 FII’s Index future open contract as on date is 397369 Longs to 75011 Shorts, Net long 322358 contracts. 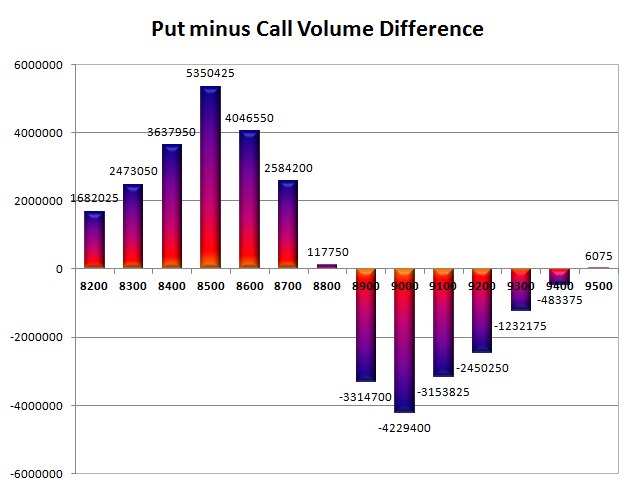 Initial support at 8700, with OI of 48.13 lacs and below that at 8600 with OI of 60.91 lacs. 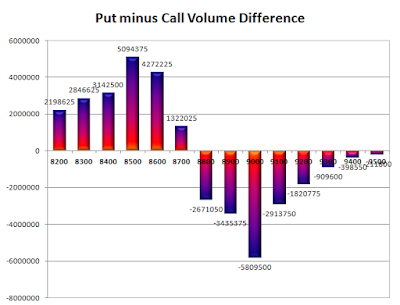 Initial resistance at 8900, with OI of 51.45 lacs and above that at 9000 with OI of 58.48 lacs. 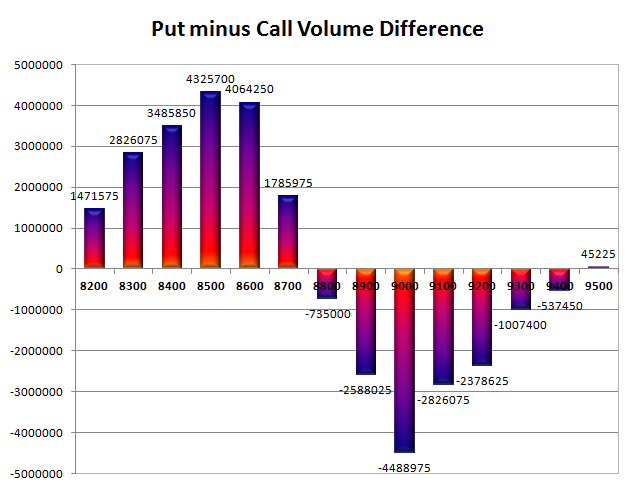 Day Range as per Option Table is 8725 - 8839 and as per VIX is 8708 - 8844 with 8784 as the Pivot. The index opened strong around 8781 and went up to touch the highs of the day at 8848, only to see huge profit booking to close at 8779.85, gain of 37.30 points. 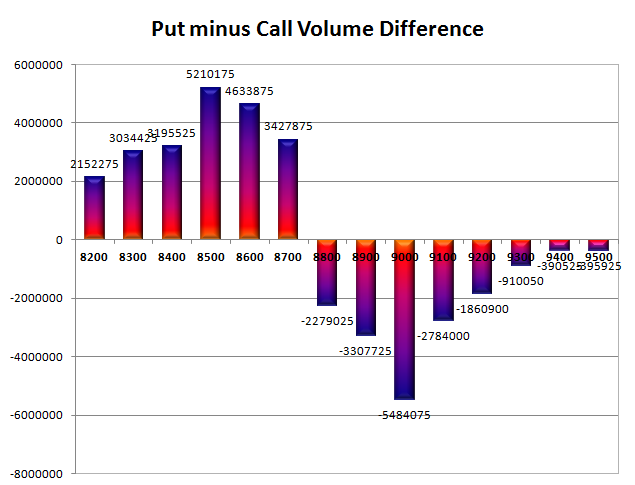 The broader market though was negative with 747 advances to 875 declines. Range stays at 8500-9000. Call option 8900, 9100 added 4.34 lacs OI with short covering at 8800 and below strike price. Put option 8900-8600 added 12.69 lacs OI with profit booking at 8500 and below strike prices. Nifty Open Interest is at 3,21,28,125 up by 80,925, with increase in price, probably long build-up. 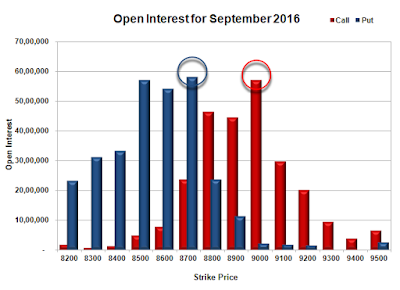 Bank Nifty Open Interest is at 22,05,240 down by 50,880, with not much change in price, probably long liquidation/short covering. 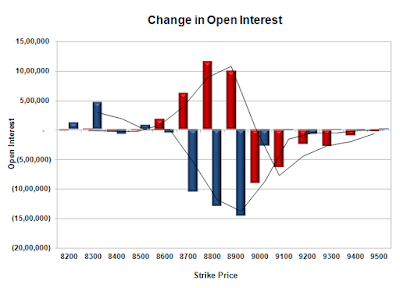 FII’s bought 6247 contracts of Index Futures, which includes net 4854 contracts long build-up and 1393 contracts short covering, with increase in net OI by 3461 contracts, includes 40700 longs to 34453 shorts for the day. FII’s Index future open contract as on date is 396416 Longs to 66161 Shorts, Net long 330255 contracts. Initial support still at 8700, with OI of 47.89 lacs and below that at 8600 with OI of 60.38 lacs. 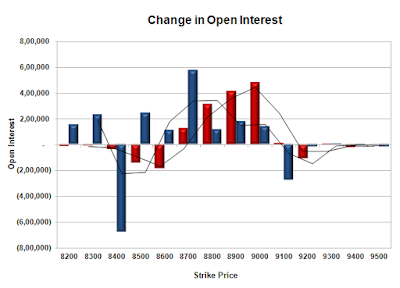 Initial resistance at 8900, with OI of 51.52 lacs and above that at 9000 with OI of 52.48 lacs. Day Range as per Option Table is 8728 - 8852 and as per VIX is 8713 - 8847 with 8793 as the Pivot. The index opened positive at 8744 and saw some profit booking, but closed in green at 8742.55, gain of 15.95 points. The broader market was positive with 854 advances to 741 declines. Range now at 8500-9000. 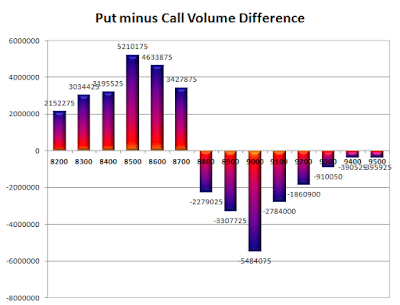 Call option 8700-8900, 9100-9400 added 12.44 lacs OI with profit booking at 9000 strike price. Put option 8700-8400 added 8.75 lacs OI with profit booking at 8300 and below strike prices. Nifty Open Interest is at 3,20,47,200 down by 5,77,050, with increase in price, probably short covering. 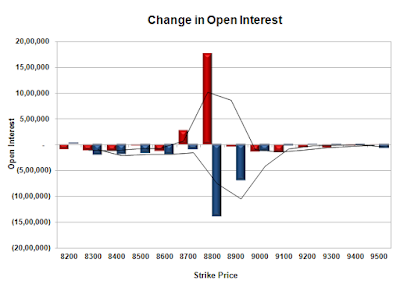 Bank Nifty Open Interest is at 22,56,120 down by 39,360, with decrease in price, probably long liquidation. 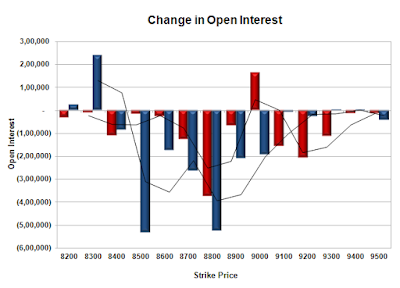 FII’s sold 9150 contracts of Index Futures, which includes net 7094 contracts long liquidation and 2056 contracts short build-up, with decrease in net OI by 5038 contracts, includes 16791 longs to 25941 shorts for the day. 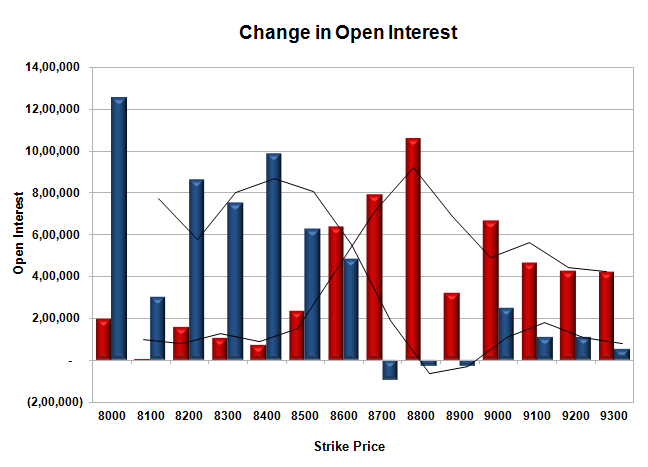 FII’s Index future open contract as on date is 391562 Longs to 67554 Shorts, Net long 324008 contracts. Initial support still at 8700, with OI of 46.09 lacs and below that at 8600 with OI of 58.19 lacs. 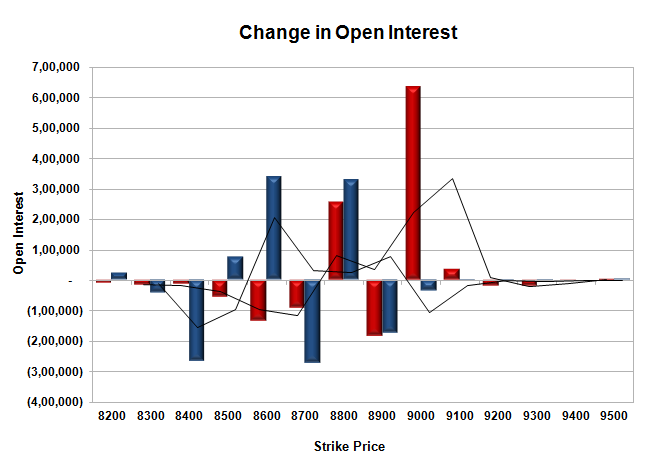 Initial resistance at 8800, with OI of 44.14 lacs and above that at 8900 with OI of 49.43 lacs. Day Range as per Option Table is 8672 - 8799 and as per VIX is 8675 - 8810 with 8733 as the Pivot. The index opened weak around 8733 and stayed weak closing near the lows of the day at 8715.60, huge loss of 151.10 points. The broader market was weak with 249 advances to 1375 declines. Range now at 8500-9000. 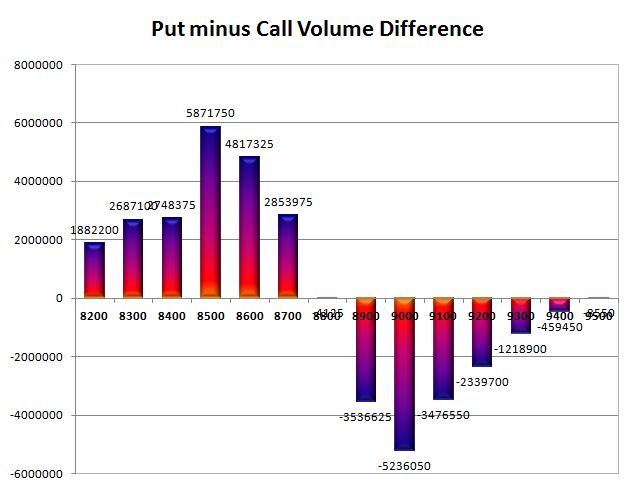 Call option 8600-8900 added 29.69 lacs OI with profit booking at 9000 and above strike prices. 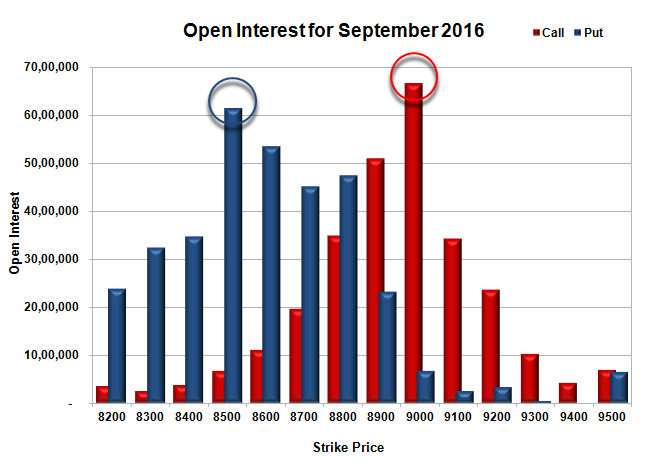 Put option 8500, 8300-8200 added 6.71 lacs OI with short covering at 8800 and above strike prices. 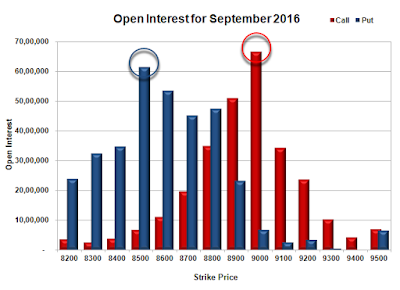 Nifty Open Interest is at 3,28,07,025 down by 6,28,575, with decrease in price, probably huge long liquidation. 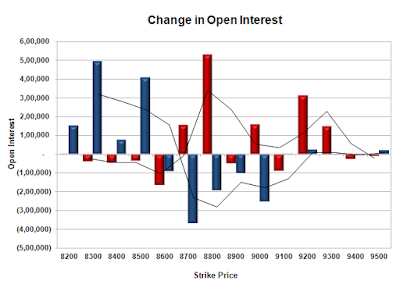 Bank Nifty Open Interest is at 23,18,440 down by 4,13,840, with decrease in price, probably huge long liquidation. FII’s sold 9959 contracts of Index Futures, which includes net 3482 contracts long liquidation and 6477 contracts short build-up, with increase in net OI by 2995 contracts, includes 46868 longs to 56827 shorts for the day. FII’s Index future open contract as on date is 400701 Longs to 58542 Shorts, Net long 342159 contracts. 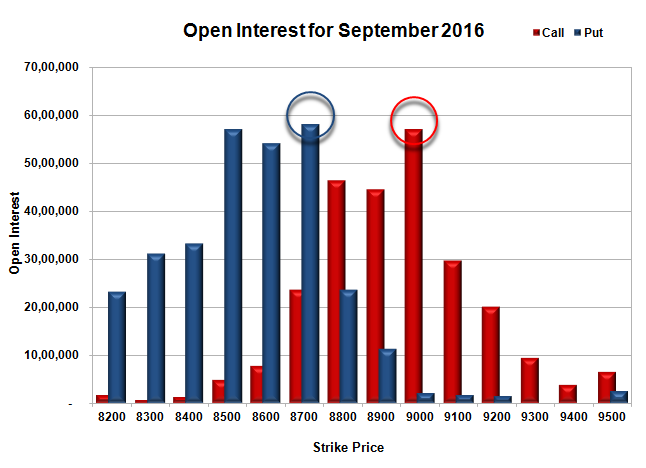 Initial support now at 8700, with OI of 44.47 lacs and below that at 8600 with OI of 57.58 lacs. 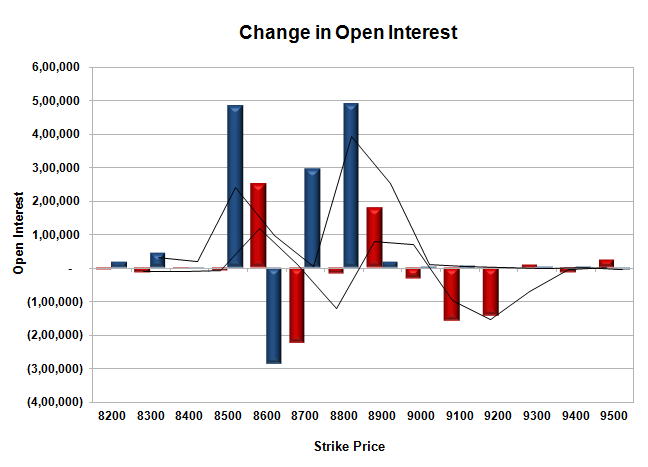 Initial resistance at 8800, with OI of 38.49 lacs and above that at 8900 with OI of 46.04 lacs. 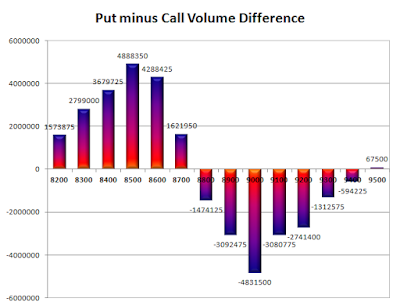 Day Range as per Option Table is 8652 - 8788 and as per VIX is 8646 - 8785 with 8721 as the Pivot.